Quantcast File System (QFS) is a high-performance, fault-tolerant, distributed file system developed to support MapReduce processing, or other applications reading and writing large files sequentially. It is also possible to obtain the QFS source (either via git clone or by downloading source tarball) and build the binaries from there. The QFS Wiki has a quick start guide to test-drive QFS on a single node. For cluster-wide deployments (simple cluster or multi-rack cluster) and administration of QFS, navigate to Deployment Guide and Administrator's Guide in the QFS Wiki. 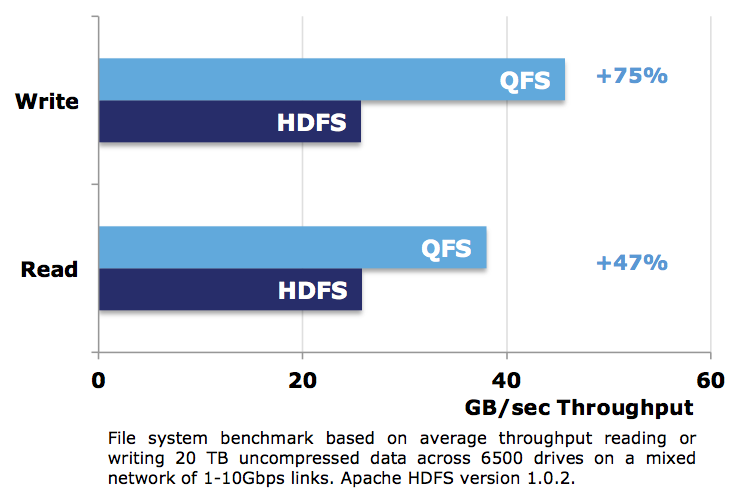 The Wiki also has details on performance benchmarks that compare QFS with other distributed file systems. QFS is an open source, community-driven project. We would appreciate your contributions. Please read the Code Contribution Policy. Join the QFS Developer mailing list or search the archives at the discussion group. Post comments, questions, patches, bug-reports to qfs-devel@googlegroups.com. QFS is released under the Apache 2.0 license. A copy of the license is included in the file LICENSE.txt. This project is maintained by Quantcast.